THON has been the most amazing part of my life so far. 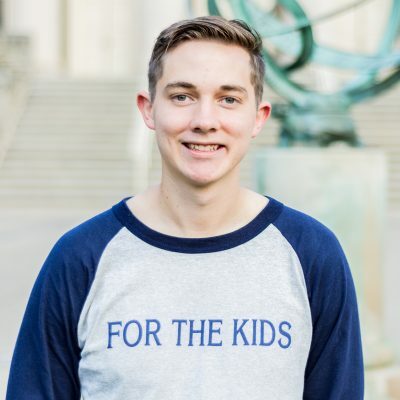 Being able to be a leader in an effort involving thousands of unique and intelligent students in supporting the many families impacted by childhood cancer has allowed me to grow both the cause and myself. I wanted to be a Director so that I could make the largest impact possible with my skills and passions and learn from the students and families involved. What are your main duties as the Technology Director for THON 2019? As the Technology Director, I lead a team of 22 captains developing and maintaining THON's technological systems. More specifically, I oversee the 5 teams on the Technology Committee: THINK, Dash, WordPress, Special Projects, and Systems. The THINK team oversees THON's primary information tracking system, THON Information Network (THINK). The Dash team oversees THON's event management system, THON Weekend Dashboard (Dash). The WordPress team oversees THON.org (the site you are on), The THON Online Store, and THON Photos. The Special Projects team oversees other systems that don't fall under the other teams, such as the THON e-Learning Management System (TeLMS). Finally, the Systems team supports the efforts of the other teams by managing the many servers and databases that power our websites. My favorite THON memory was the family hour of THON 2016, my first THON. Locking arms with my committee and listening to the stories of those who had lost their battle was moving. That moment instilled a passion that I had never experienced before, and I left the Bryce Jordan Center that day yearning to make a bigger impact. “Those who dream by day are cognizant of many things which escape those who dream only by night.” - Edgar Allan Poe "It's dangerous to go alone"